is by Jackie Hendricks of Plain-n-Simple Dolls. 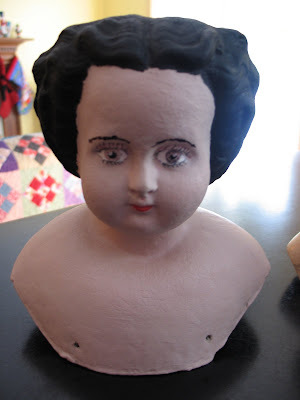 What do you do when a friend offers you a badly repainted antique papier mache Indesctructible head in trade for making some clothing for her antique dolls? If you can't resist taking a misfit and redeeming her, you say, "Yes, please." Especially if she looks like this. Because you can see past the orange peel surface, and the child-like repainting. You know she's not an ugly duckling but a swan. She just needs some loving. In the form of paint. She also needs a body that is appropriate. who shared her pattern with me! she needs long arms to hold dear dollie friends. Companion Doll by Teresa Baker of Dolls of Yore. in purchase price or for sale). inspired by real antique undergarments. She needs stockings to cover her sweet little toes. among the summer flowers in. months of picking colorful summer flowers. She is perfect to hold smaller dolls. and is now ready to travel to her new home. Your work is amazing. The attention to detail floors me. Good luck.